I had good news and bad news for my client. Yes, it’s possible to fall in a version of love with someone in a short amount of time. But more often than not, when we feel head over heels in love with someone shortly after meeting them, it tends to be a bad sign. We can fall into infatuation very quickly, but real, deep, genuine, lasting love takes some time to develop. There’s an analogy that I often use when it comes to the two distinct ways that love develops in new relationships (that will help you to know whether you should stick it out or you should run). Introducing, my ‘kindling vs. coal’ theory. If something like love seems to develop overnight (or in a single moment, i.e. love at first sight) then this is often a sign that our unconscious emotional wounds have been triggered and we recognize our mutual/shared dysfunction in the other person. While these relationships can be deeply healing, for a time, they’re often short lived relationships that serve as a catalyst for our emotional growth and development. These quick burn relationships are the ‘kindling’ relationships. They light ablaze quickly, and then burn off into short-lived ashes in a metaphorical matter of minutes. 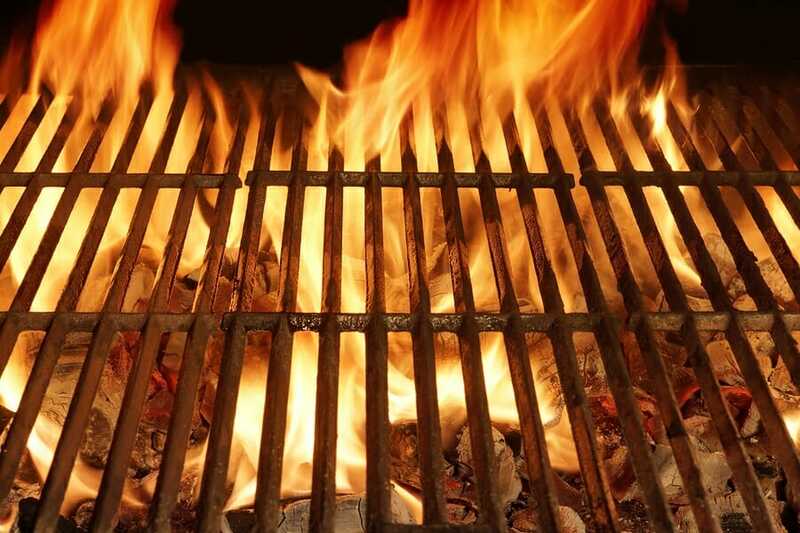 The other way that love develops is more akin to how barbecue coals gain heat over time. They take longer to reach a burning point, but once the heat has been cultivated they have a much more resilient staying power and throw off heat for a much longer period of time. In the book The Happiness Hypothesis, author Jonathan Haidt talks about this phenomenon in what he labels passionate love vs. companionate love (passionate love being kindling, companionate love being coal). One is a quick, flash-in-the-pan relationship that quickly peaks and plummets, while the other gradually gains momentum over the course of years/decades. In fact, this phenomenon was charted over the course of sixty years (through real, scientific data!). 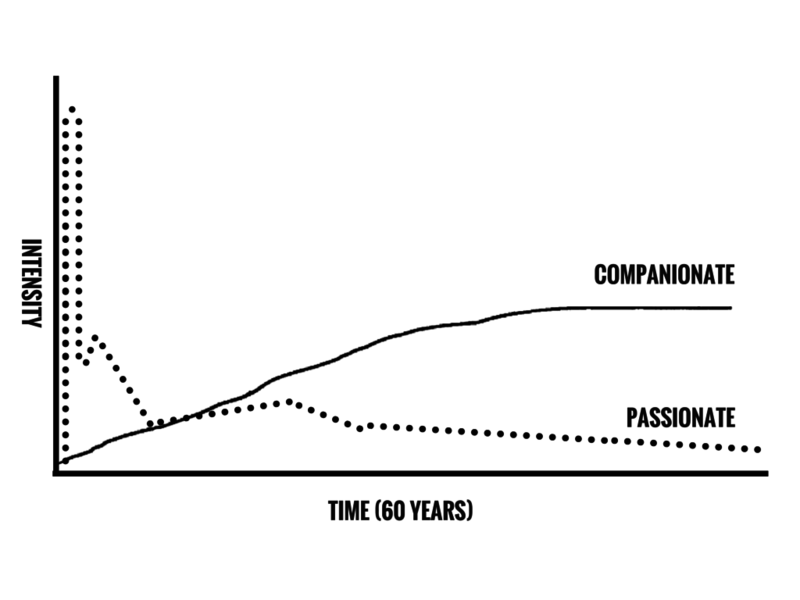 Check out this simplified graph of what the passionate love looks like in comparison to companionate love. While the companionate love never appears to hit the same cocaine-high level as passionate love, you’ll see that it is the one that grows in value over time. When given the choice between decades of fulfillment and joy versus a couple of months of excitement, I believe that the choice becomes obvious as to which one is more cumulatively beneficial to our well-being. If you have even the slightest willpower at your disposal (and you aren’t starved for love), the choice is an obvious one. So if you are prone to chasing after the all-consuming, love-at-first-sight kind of love/infatuation, then you might want to cool your jets and wait for something that sparks your interest in a more level-headed way. Instead of “I’m already SO in love with them!” after a first date, you want to aim for more of a “They’re really interesting. I’m intrigued by them. I’m not 100% sure where it’s going to go, but I’m looking forward to spending more time with them soon” kind of vibe. Ultimately, if you’re looking for a long-term committed relationship, you want to hold out for the kind of attractions that only grow with time. If you can honestly say, week after week, that you love them a little bit more every day, then you are likely in the midst of a healthy, slow-burning, companionate, ‘coal’ relationship. Ps. Not sure how to meet and attract an intimate partner that is healthy for you? You might find this article interesting.